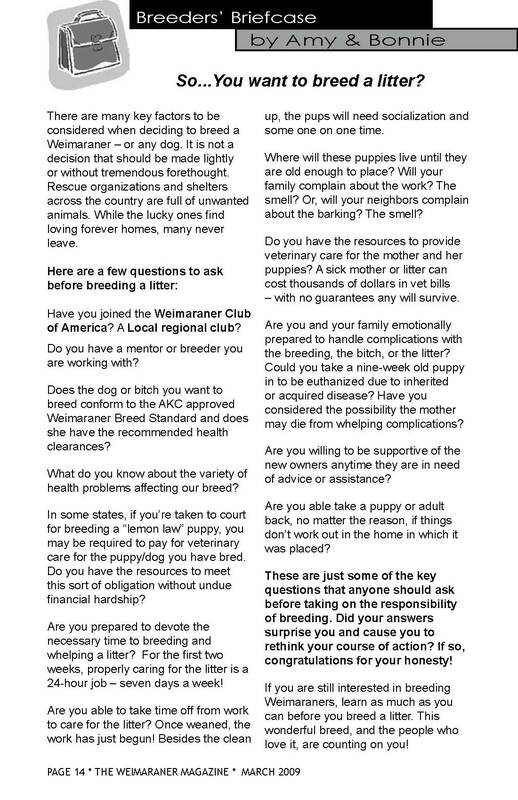 And for the BWCA Approved Breeder; when a potential buyer asks if you are a BWCA approved breeder, it indicates that the dog-buying public is becoming more ’aware’ and educated regarding the purchase of a ‘family member’ that will be with them close to 15 years and therefore want healthy, sound companions. Your association with BWCA lets Buyer’s know that you as a breeder are in agreement with and uphold the standards of the BWCA Code of Ethics and Breeding Recommendations referenced above. BWCA encourages blue Weimaraner breeders to apply to become an approved breeder and encourages buyers to buy from a BWCA approved breeder. I always thought the blues were beautiful. After seeing so many thru doing rescue I just couldn’t believe that they could be anything else BUT a weimaraner … all the snobbery of the Gray people … I love the grays too … don’t see ANY difference other than the color. I’ve fostered lots & lots & both colors & never understood what the big whoop was. Becky I believe a lot of the ‘big whoop’ has moved on and is more over the use of the breed name. The originators of the breed in Germany did not establish blue as a colour in the standard. That said if a new breed is being considered I believe a new name would also be acceptable, say the ‘Blue American Pointing Dog’ it would fall more into line such as names like the ‘American Cocker Spaniel’ per say. When it gets to that point, a new name will follow but we are a long ways a way right now. I have a blue male, beautiful dog. I owned his mother and father and bread them to get Apollo, and now I am looking for a girl friend for him so I can get one of his daughters. His mother is a silver/gray. I hope that’s not a problem, but would you have any suggestions or recommendations. I’m not trying to get a champion, I just loved his family, and would like to continue it. would like a male blue Weimaraner puppy under one year. do you know of anyplace in Florida that has them? Hi, I just found a puppy that appears to be weimaraner. How do I know if it is one? ?